Atmospheric scientist, Carolyn Jordan, talked about how models are used in studying ocean/climate systems. A model design is driven by the purpose and goals of the researcher, which in turn determine the modeling process that is needed. This requires a multifold research approach. Carolyn's concept map illustrates some of the physical, chemical and biological processes that are taken into account in her models. The phenomena being studied can involve impacts or processes at different scales, from global down to an individual organism. Carolyn's presentation used aerosols to illustrate these varied scales and processes that she studies in her work. 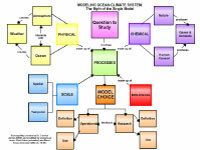 Her concept map offers clear and effective videos illustrating the processes she discussed. At a COSEE-OS workshop held in 2009, Kate Leavitt collaborated with University of New Hampshire scientist, Hui Feng, on his concept map about ocean aerosols. In this webinar, Kate described how she subsequently worked with Dr. Feng to adapt his map as a training resource for her co-workers at the Seacoast Science Center. She discussed the challenges informal educators face in translating high-level science content for general audiences who visit the center. Kate's presentation described useful techniques for explaining somewhat abstract ideas like clouds, aerosols and gases, and she shared lesson plans and activities that could be adapted to a variety of educational settings. 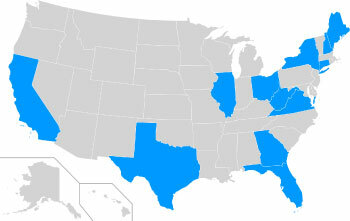 Twenty five participants joined in from twelve different states. Of the six participants who filled out the post webinar survey, 83% said that the scientist presentation was "useful" or "very useful", and the same percentage said that they felt more comfortable with the topic than they had before. 67% also said they now feel the topic is more relevant to their own work.